On Monday, Covington's Urban Design Review Board met to review revised facade plans for 630 Madison Avenue where the former Wedding Mall currently stands. The Wedding Mall, a two-story commercial building built some time between 1920 and 1940, had its facade covered with a wrap in 2005. It is not considered to be a contributing building in the city's historic stock. In January, Jim Guthrie of Hub + Weber Architects presented plans for a a closed courtyard that included demolition of the former Wedding Mall and the construction of a new facade with a cornice line that would align with the new Hotel Covington's at 638 Madison. A storefront appearance would be kept with the facade broken up into three large bays, with the central bay serving as an entrance to the new courtyard space and the outer bays covered with a decorative metal screen. A one-story glass addition would sit back into the courtyard and will be glass on all sides, approximately 48-feet long and 15-feet high and there would also be a metal awning and re-purposed siding installed on the exposed side of 638 Madison in the courtyard space for an outdoor bar area. At that meeting, then city Historic Preservation Officer Beth Johnson recommended approval of the application with the conditions that the final screen design, as well as the material and colors for the cornice and metal be reviewed and approved by staff. The UDRB instead opted to table the issue until more finalized details about the facade were available. "That one looks like a bad 50s addition," board member Charles King said at the time, adding that he doesn't think it works or conforms to design guidelines. 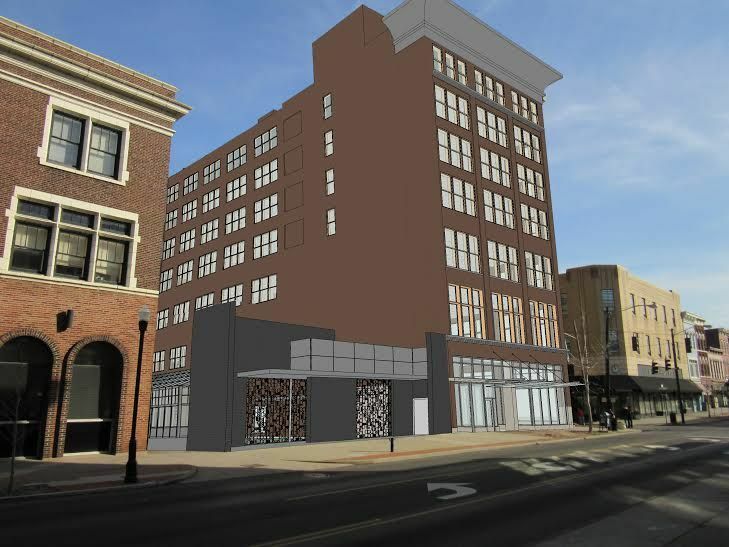 Johnson recommended that the UDRB approve the facade with the condition that if the Kentucky Historic Preservation Office, which is reviewing the project for historic tax credit purposes, approves of the courtyard's design, then so would the UDRB. The board instead voted to accept the developer's plans for installing windows where currently there are none on the hotel building, but placed a condition that the courtyard's facade would have to return for approval. Yesterday, Guthrie returned with updated plans that were less contemporary. Rather than a decorative metal screen, the outer bay storefronts will remain glass and special attention will be paid to the cornice which was ornate on the original structure. The original cast iron columns will also remain and there will be no recessed areas on the facade. The board unanimously approved the proposed changes and will submit the plans to city staff for review of materials and final approval. Board unanimously approved all plans presented by Manoj Desai, owner of 437-439 Greenup Street. 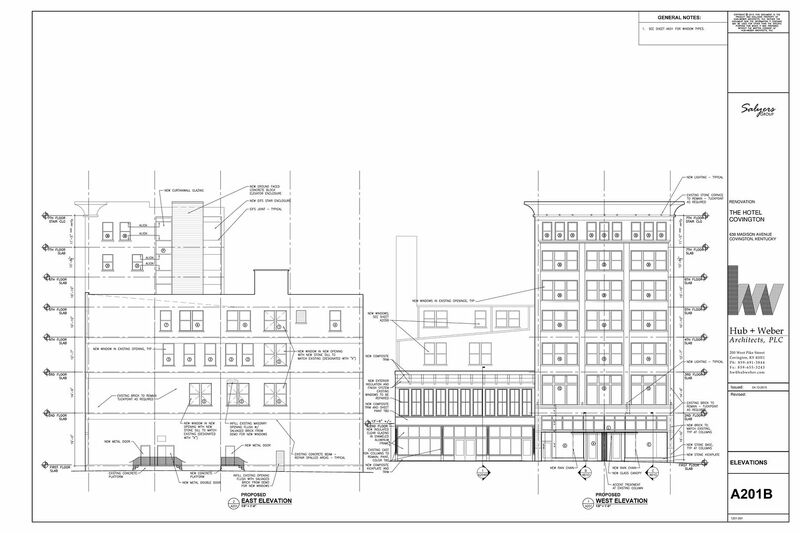 The plans call for the demolition and rebuilding of the existing wood structure on the rear facade, the rebuilding of the rear entrance, the demolition and rebuilding of the wood structure on the third floor of the building, and the removal of the existing tree on Greenup Street and the planting of replacement street trees. Vote to allow the replacement of 10 existing windows on a property in the Mainstrasse Historic Overlay Zone at 948 Philadelphia Street with double hung, beige vinyl windows ended in a 3-3 tie. A motion to table the plans until the property owner provides a quote on aluminum clad windows was approved unanimously. Plans for the construction of a roof deck addition on the 3rd story of the rear facade at 230 E. 2nd Street were unanimously approved by the board.